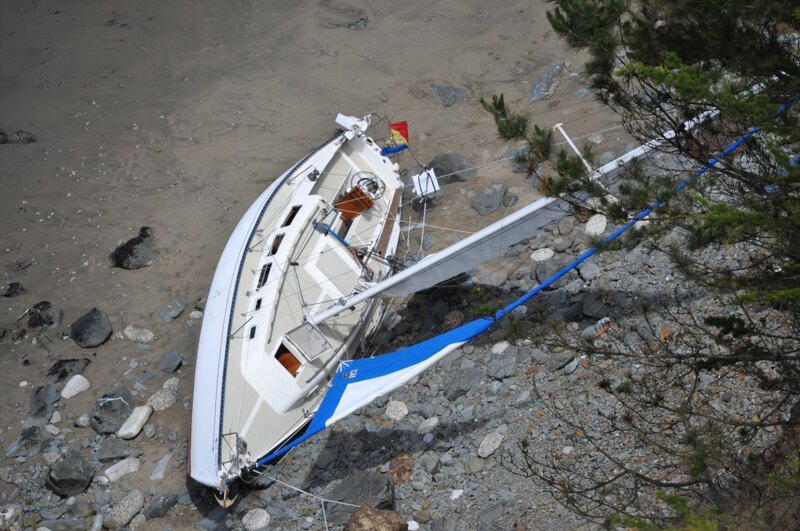 I fear I know all too much, minus the details, about what happened to the Ranger 33 that sailed itself onto China Beach late Sunday afternoon, without the two sailors who had earlier departed Pillar Point Harbor for a north-bound daytrip to San Francisco Bay. 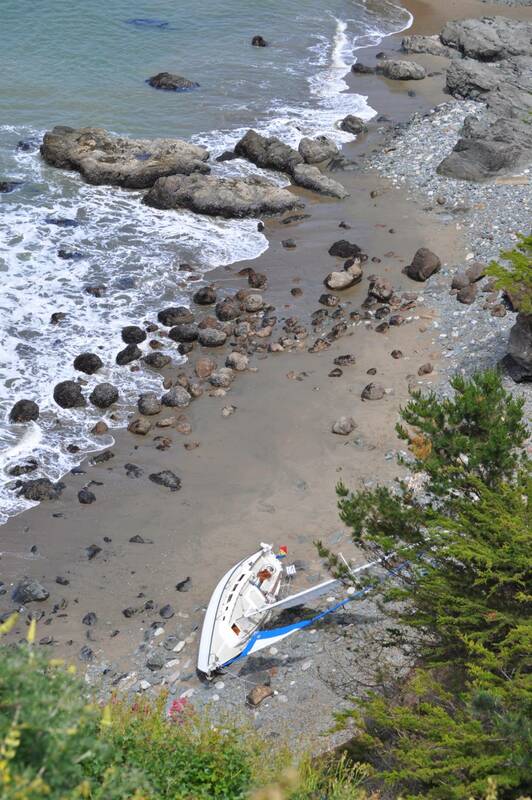 According to the same news reports that others have heard, observers ashore at the Cliff House restaurant—at Land’s End, the southwest corner of the Golden Gate Strait—reported seeing the boat “capsized,” prompting a Coast Guard response. Capsized is probably the wrong word. I saw the boat upright and sailing two+ hours later, so I assume that it took what I would call a serious knockdown. Whether or not the reportedly-experienced sailors Jeff and Beth Easterling were washed overboard from Barcarolle at that moment is impossible to know. Two bodies washed up at different points, one at the seaward face of San Francisco, Ocean Beach, and one, by the reports, “on the rocks,” meaning the corner of the entrance to the Strait, or just inside. This will surely, and should, renew the dialogue about tethers that flared up following a different overboard incident a while back, an incident that was less deadly, but only by luck. Barcarolle when I saw it was in the Golden Gate Strait off the Sea Cliff neighborhood, at least a mile east (toward the bridge) of Land’s End/the Cliffhouse and headed westbound in the Golden Gate Strait (meaning outbound, back toward the point of the knockdown). The boat was sailing under reefed main with the jib rolled up small. It had been sailing-drifting in strong winds and severe chop and apparently had gone on quite the walkabout. The moment I saw it struggling along with a 47-foot Coast Guard motor lifeboat on its hip, I knew something was wrong. Which strikes me as strange, considering how long the boat sailed itself around, but again, I wasn’t there . . .
Certain points of speculation come easily, since Barcarolle was arriving from the south and would have to make a right turn (altering course to starboard, as my nautical friends say) at the entrance to the bay; that turn would have placed the boat beam-to the wind and sea rolling down from the northwest. That could account for the knockdown. There’s also the fact that there is a bar—shallow water—off the entrance. And yes, there is a South Channel leading through the bar, but for my money it should be known as the Alleged South Channel, to remind people that there are times when you just don’t go there. Arriving from a close-by place like Pillar Point Harbor, it’s a long hike seaward, out and around the shallows of the South Bar, to enter San Francisco Bay via the deepwater shipping channel. That route adds a dogleg to the journey, and the dogleg adds miles. But. Small boats can cross the bar in reasonable safety in mild to moderate weather. Fishing boats often work right on the bar. But you have to remember the impact of shallows on wave and swell. The generalities are simple: Over shallow water, waves grow higher and steeper. The particulars are more complex: Rarely, but definitely, small boats have been destroyed along with the people aboard even on golden, calm days. Waves come out of nowhere. Something steep and breaking rolls in cross-pattern, landing on the deck like a hammer. Unlike the Potato Patch Shoal to the north, there is no colorful name attached to the Southern Bar, which shoals to as little as 32 feet, even in the so-called South Channel that parallels Ocean Beach. This one is simply not an option on a foul day. Don’t go there in rough weather, ever. And don’t go there in mild weather without thinking of the early Greek mariners. They experienced the behavior of the sea as explorers and interpreted everything that happened to them as well as they knew how. Everything that happened, they believed, was the whim of a god, and the gods who followed them over the sea were perverse, spiteful, and scary. I wish I thought I would never have to write about this again.